Wow! How about that blog hop? So many unique, inspiring, and amazing projects!! A HUGE thank you to everyone who participated! You've all been a big part of eP's growth and we are so grateful! And now...on to our prize winners! 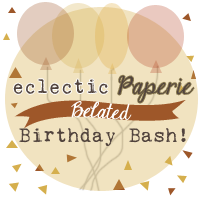 If you see your name listed below, please email me at kim@eclecticpaperie.com to claim your prize! Congratulations! OMG! I won! I won! It's me, right? THANK YOU SO MUCH!!! I can't believe I won. Thank you so much. Congrats to all the winners. Thank you so much! I had so much fun creating some of these projects, they were very inspirational. My little niece and her friends were over the moon with some of my doll stamp creations I gave them, of course using the ideas presented in the blog hop.